A relationship between Kentucky, mint juleps and its horseracing culture is woven into the state's history. In the 1700s, settlers introduced horses and stills to the region. The area's early population became so spread that residents went without seeing their neighbors for long periods of time. They formed large social gatherings -- now known as county fairs -- to become reacquainted. They raced horses, swapped stories and bragged about their bourbon. A lifestyle was born -- one that thousands of mint julep drinkers will savor this week at Churchill Downs. "We know from historic resources that juleps and bourbon and horse racing have been intertwined since the very beginnings of Kentucky," said Chris Morris, a master distiller at Brown-Forman Corp., which supplies the whiskey used in most mint juleps sold at Churchill Downs. "It's only appropriate that they are still in play at the Kentucky Derby." Morris said the most genuine mint juleps are crafted by hand. Start with a level teaspoon of sugar placed at the bottom of a silver julep cup. Add fresh mint leaves and a splash of bourbon. Then tap with a wooden muddler, a tool used to smash the mint leaves to release flavor. Fill with crushed ice, muddle again and pour two ounces of bourbon. Finally, refill with loose crushed ice and place a crisp mint sprig next to a plastic straw. 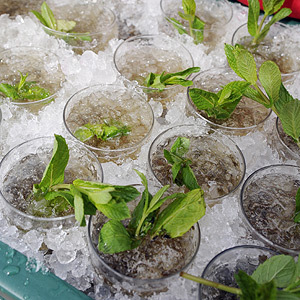 This week, officials anticipate more than 120,000 mint juleps will be sold at Churchill Downs. For the past 23 years, more than 2.5 million mint juleps have been served between Kentucky Oaks and Derby Days at the legendary track. "Julep drinkers will probably have three or four over the course of a day," Morris said. "Of course, it's a long day. Most people get to the track by noon. The Derby is not run until after 6, so it's a good long day."